Our blog sites create their own ambiance, where we bloggers carefully craft our pages to be inviting and a warm place to visit. Each blogger creates his or her own character (some might call it a brand), by choosing a nice theme, compelling images and colors they love. In a previous post, I offered some easy ways to refresh your website. With that idea, I submit for the weekly photo challenge, the Ambience created when spending face time with a fellow blogger. A little ambiance next to the fire! Liesbet and I met by way of a blogosphere introduction through Janis of Retirementally Challenged. Liesbet and Mark spent two nights with us in between house sits. They recently spent a few months in Rocklin, a suburb of Roseville, CA. They had not yet visited the American River Bike Trail, so on a sunny, cold day, we took a walk along the trail and beheld a very full American River. They are off to the north Bay area for their next adventure! Liesbet and Mark taking Aero for a walk while I take photos! Lisa Dorenfest –her pages are filled with her amazing photos of her life sailing the ocean. 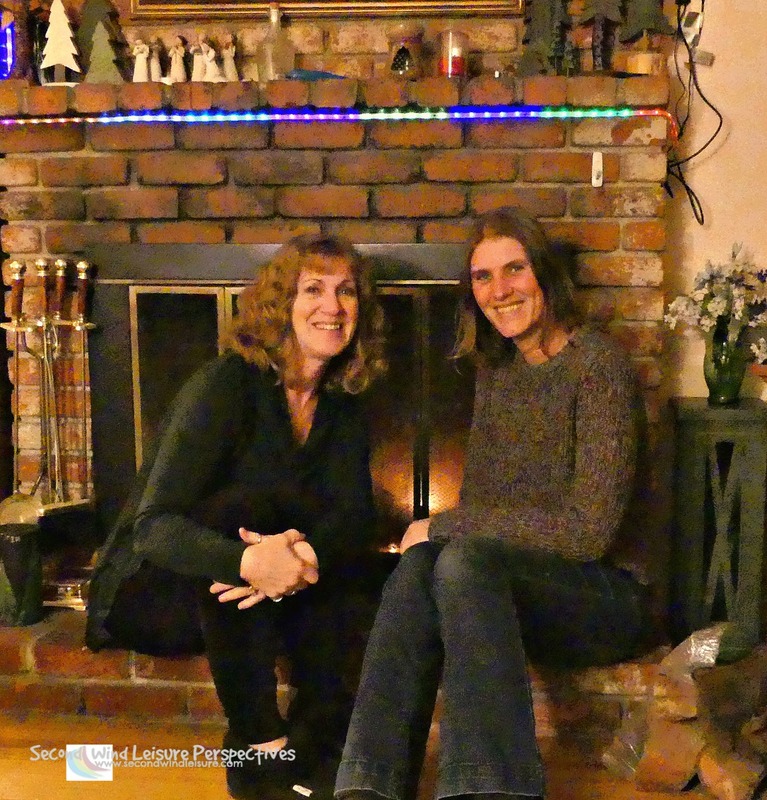 Roaming About –Liesbet has sailed with Lisa! Trail Walker –her pages are filled with stunning photography of lovely birds and wildlife. What ambiance does your blogsite create? Thanks, Debby! I think your is,because I wanted to use your theme! Oh, how I was I had been there too! You all need to plan trips out to Vancouver Island! Nice post. Liked the idea. I know it makes me feel good when sharing a musical ambience on my blog where others can also enjoy my discoveries and interests. It would be fun to visit sometime when we visit California. I have done the same thing Terri and was so happy when I met a fellow blogger and his wife when my husband and I visited them in Canada. We also met a fellow blogger during our trip to China, which was equally successful. It’s so much fun and you have a great foundation on which to draw from the get-go. Glad it worked out for you too! That’s great to hear, Tina. Seems more bloggers are able to get together in person more often! You have created a wonderful calm and friendly ambience here Terri. I choice bright, loud colours for my blog as I hope it creates both fun and cheeriness! Thanks, Judy! For February, I’ll go pink! Your blog is cheery! Oh, that will be pretty Terri, and very apt! I’m am so happy that you were able to arrange a meet up with Liesbet! I hope that one day I will be able to meet her and her husband too. Funny, today my husband and I were able to get together with Kathy and Thom (SMART Living 365) for lunch in Indian Wells, close to Palm Springs. I love, love blogging meet-ups! Oh how fun! Aren’t they a great couple to hang out with? How fun to meet a blogging friend! The blogging world really does inspire friendships with people from all over the world! Just found your blog! I’m still working to create a unique “ambiance,” and hadn’t given much thought to actually meeting another real-live blogger in person, so this was an eye-opening preview of things to come. Thanks for sharing! Thank you for checking it out! I have met quite a few bloggers in person. It is really a treat! Good luck with your WPC theme! Aww, thanks, Lisa! I didn’t realize you and Liesbet were friends and had sailed together. The world is a TINY place in some ways. You can visit me in Sacramento ANY TIME!! And I’ll just rent a helicopter and drop in on you on the ocean someday ala I Love Lucy 🙂 Big hugs back!! Lisa was the one who introduced me to Liesbet! So glad that I was able to pay it forward. Yay! Oh the small world we live in! perfect ambiance and how wonderful to spend time with a fellow blogger! It’s like we always have been told—walk into your house and pretend like you’ve never seen it before. It could be a good exercise for the blog too! The problem is my perspective is tainted!! I need outsiders to tell me their opinions!! Yes! I see my house in a photo and egads! time to move some clutter! Wonderful photos! So nice that you could meet friends from the blogosphere! Thanks, PJ, the timing worked out well! A great interpretation of the theme, I would say. 🙂 It was so nice meeting you and your blogger husband, Terri. And the furry ones as well, of course. Thanks again for being our hosts and for the shout-out! Enjoy this sunny weekend, and your new camera!! PS: our new home had two bird feeders and about five hummingbirds flying on and off constantly, so I will be thinking a lot about you. Thanks for being the subject of my post today! I hope you get some great photos of the birds and enjoy your place! I like your discussion of ambiance very much. Well done!